There are certain qualities in the entrepreneurs which make them successful. All of these qualities are in-born qualities and some can be learned from experience. Let us deep dive in to the topic that Are you suitable for running the business?Find the qualities needed for a successful entrepreneur. To become successful in the business self-discipline is the foremost trait. The self-discipline, self-mastery, self-control, self-responsibility and self-direction make them to reach success in the business. Discipline makes them to be responsible in the business and achieve the success. The knowledge and experience is the base of the confidence. Entrepreneur does not ask question about the success and they are bold enough to face the problems. The main quality of an successful entrepreneur is confidence and the boldness. Entrepreneurs are open-minded and they welcome the different business opportunities to earn money. They think about the work plans, people skills and the new business ideas to become successful. Entrepreneurs are self-starters and they work hard to achieve the goals which they want to achieve. They are not working under the control of the big management. So, they set goals and work hard to achieve the goals. Entrepreneur thinks about the success and their own track of success. They think about the market and methods to win over the competition. Their focus is towards the money and success. One of the qualities of the entrepreneur is creativity. They will shape and model the products as per the creative mind of the students. The solutions to the problems and they know how to market their products creatively. The entrepreneurs have skills to understand the people around them and use the people for the different roles. They know how to train the people and bring out the skills in them. They have the mind to listen to the different types of people and make them happy. Entrepreneurs are highly passionate towards the work they do. They love their work and they love to put extra effort to work freely to improve the business. They have full freedom to implement whatever they want in the business. They follow the business ethics and they match the expectations of all sorts of people. They give respect to the sentiments of the people and use the skills of the people to develop their business. 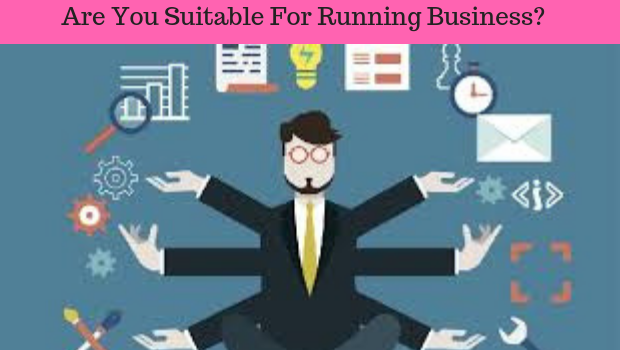 Author adminPosted on November 23, 2018 Categories BusinessTags Business, Qualities of a business man1 Comment on Are you suitable for running business?